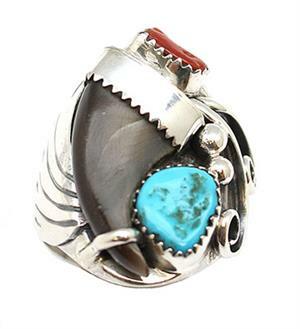 This sterling silver sand cast mens ring has a natural bear claw, a free form turquoise and coral stone with a fan on one side and swirls on the other. Top of ring measures approximately 1 1/8" long by 3/4" wide. Crafted by a Navajo artisan. Shape and sizes of stones will vary as well as size of claw. Request sizes when ordering. Currently available in size 11, 12, 12 1/2 or 13.